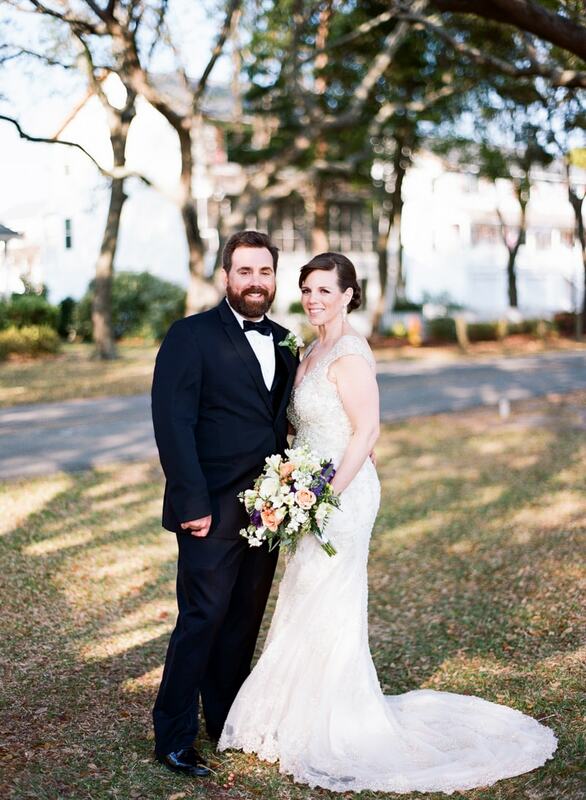 We had the pleasure of photographing Liz & Danny's wedding in Beaufort, North Carolina. It was a beautiful Crystal Coast wedding. After their ceremony they had a second line march from their band. This is very popular for weddings in New Orleans. Sometimes we capture moments like this right in the middle of formals. We love it! We love our bride's bouquet. It was perfect for their Spring wedding. The purple flowers add a nice pop of color. The reception flowers were very similar to the bride's bouquet. For the centerpieces, they added more color by mixing in pink and red flowers. We love how they incorporated baseball into their decor. Each table displayed a different player. Congratulations Liz and Danny! We're so happy for you two.